You'll be £14.00 closer to your next £10.00 credit when you purchase The Kaiser’s Battlefleet. What's this? The battleships of the Third Reich have been written about exhaustively, but there is little in English devoted to their predecessors of the Second Reich. 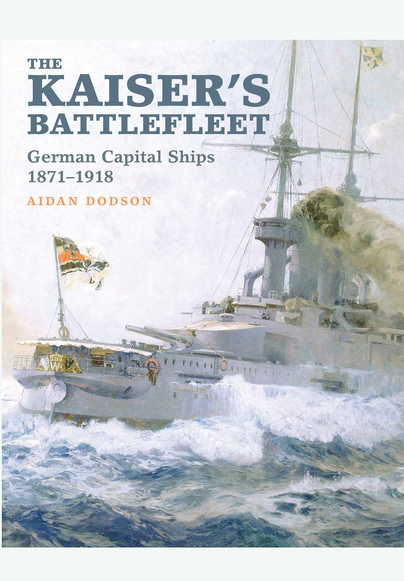 This new book fills an important gap in the literature of the period by covering these German capital ships in detail and studying the full span of battleship development during this period. A key objective of the book is to make available a full synthesis of the published fruits of archival research by German writers found in the pre-WW2 books of Koop & Schmolke, Großmer’s on the construction programme of the dreadnaught era, Forstmeier & Breyer on WW1 projects, and Schenk & Nottelmann’s papers in Warship International. As well as providing data not available in English-language books, these sources correct significant errors in the ‘standard’ English sources. This entirely fresh study will appeal to historians of WWI German naval developments as well as to enthusiasts and model makers. This is a very nicely produced and balanced reference on the Imperial German Navy’s capital ships from 1871-1918 and beyond. Highly recommended for its narrative quality, balance of technical and design information, and all around usefulness as a general reference on the ships of the era. As long as the reader has the patience to read this book carefully, they will be richly rewarded. This is a perceptive study which is highly recommended. Dodson's book remains a specialist work and, alongside its contextual analysis, has a heavy emphasis on technical data. Thus, it will appeal mostly to naval historians, World War 1 researchers, wargamers, and dedicated warship buffs. This book is profusely illustrated with photographs, charts, maps, and line drawings. Three appendices are provided as is a bibliography and index. Highly detailed technical data is provided both throughout the narrative and in the technical and career data section. Dodson, then, has provided a remarkable vade mecum of Imperial Germany’s capital ships from 1871–1918 and beyond. He has placed the buoys for future scholars wishing to navigate the shoals of the design, construction and use of these ships. This book will stand as the definitive starting point for research in this field. To me there is something quite stirring and emotional about images of warships belching out big clouds of black steam and smoke into the air. In the environmentally conscious world of the 21st Century it may be out of the question but at the turn of the 20th it was commonplace. This new book is replete with such evocative images and charts the history of not just a navy but also the development of modern German from its feudal discordant past to the powerhouse of Europe it still is today. This thread is found through this excellent book and it is one that is essential to comprehend when studying the why's and wherefores' of the Imperial German High Seas Fleet. This heavyweight tome is exceptionally well researched, even if it sometimes does lurch heavily towards academia in places. For the vast majority of readers it will give an insight into how the Imperial German Navy's principal warships were designed, built, fought and died ranged against the might of the Royal Navy in World War One. battle-cruisers, with photographs, profiles and plan drawings plus accompanying text. Other chapters address how the Kaiser's battlefleet performed in combat. A concluding chapter traces the careers of a handful of surviving ships after the German fleet was scuttled at Scapa Flow in 1919. For the record, the last surviving capital ship was Goeben, transferred to the Turkish Navy in 1914, and broken up in 1973. The book contains many clear photographs which will provide a useful resource for any student of the era and of contemporary German naval practice. In precis, this work is clear, concise and comprehensive and would be a valuable addition to the book collections of anyone interested in German and European history, the Imperial German Navy and large naval vessels. It is an invaluable resource. On a Rating Scale where 1: very poor; 10: excellent, I would give it an 8½. AIDAN DODSON is a Senior Research Fellow in the Department of Archaeology & Anthropology at the University of Bristol. In this field he is the author of seventeen books and over 300 articles and reviews. He has also published a number of papers on naval matters, and worked on a number of naval projects such as the Offshore Patrol Vessel HMS Clyde.